For the last two weeks the euro vs dollar has consolidated sideways between USD1.34 and USD1.36 following its rapid fall as a consequence of the Greek fiscal problems. In the last few days we have seen several tests of the USD1.3450 price handle which, to date, has held firm suggesting that this is now creating a platform of support for a possible move higher. Tuesday’s candle, in particular, was significant ending with a deep shadow to the lower body and with the 9 day moving average providing solid support to the day’s trading action with Wednesday’s candle following through this hammer signal. In addition yesterday’s price action also closed above both the 9 and 14 day moving averages. Whilst the longer term outlook for the eurodollar remains bearish in the short term we can expect to see a continuation of the current rebound. 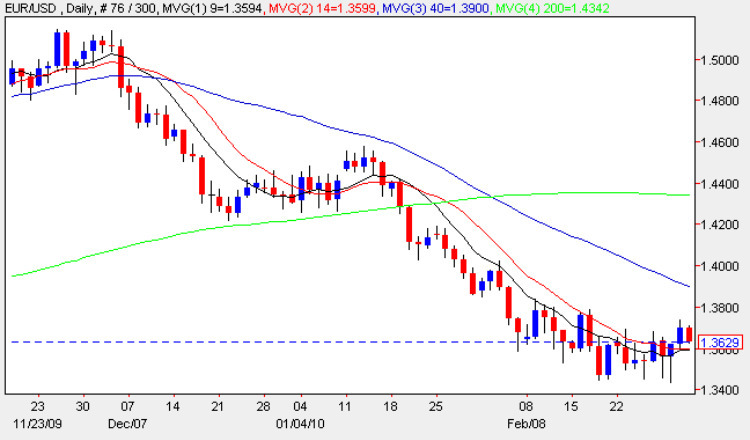 However, for the short term rally to be converted a longer term upwards trend we need to see a break and hold above USD1.38 which would then run into resistance in the USD1.41 area and in addition would need to cross the 40 day moving average.